New uniform for the Buccaneers. EDIT: Full gallery here. Great analysis here also. Nothing too surprising. I am sad that they did not reveal the other pants choice or the two other socks choices. The font for the nameplate I will have to get used to. The red jersey is still slightly better but overall, not a huge fan. But I suppose in time and seeing it in action will change my thoughts. The Buccaneers are scheduled to reveal their entire new uniform set on Wednesday, but today they decided to show one photo of their new design that took two years to create. Since this is just one photo, I will point out some elements that I notice and wait until Wednesday to have the full rundown. Starting with the pewter shoulder yoke, I can dig it. The color itself is unique and I like how the trim is Bay Orange, contrasting with the bright red flag. In fact, the Bay Orange as a trim adds a nice touch. However sine it’s a Nike template, part of the trim was design with the flywire in mind. It’s fine, but that’s what I will always notice. And one more thing that is hard to see is that you may not notice is that right shoulder features the flag logo while the left one says “BUCS” right under the Nike logo. Very subtle, but very unnecessary. The font is terrible. It’s not good. It’s not good at all. A digital clock? Pewter pants is fine with me but this photo makes it look black. I assume it will look different outdoors. I will say that even though the pants are a good color, the piping on the pants isn’t. It’s not really piping or a stripe. It’s just an element of color. Like the Jaguars, this design doesn’t start at the hip and end at the knees, it starts in the middle and somehow that is a good design? Of course, this is also part of the classic Nike template, so the potential design is limited on their own end. Are the socks black or pewter? This one is pewter. According to the press release, the team will have two jerseys, two pants, and three sock options. I can assume the sock colors would be red, pewter and orange? Or maybe black? As for the pants options, white may be the other one? I will reserve judgment until Wednesday, but so far, this uniform set isn’t all that great. I wish they never changed it. All I can see now is the A-Team Van. 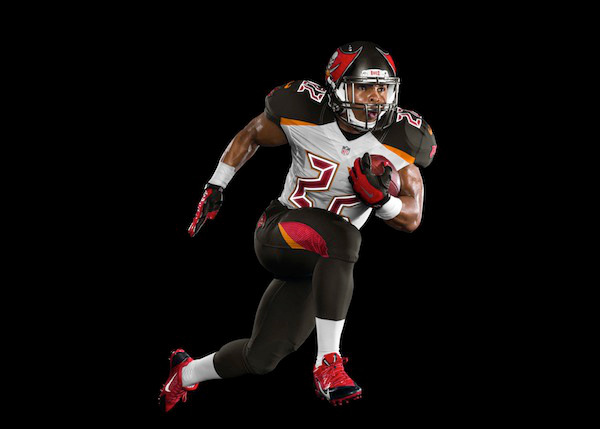 This entry was posted in New Sets, NFL, Tampa Bay Buccaneers, Uniforms & Design and tagged Nike. Bookmark the permalink.